Read the article at the Dallas Morning News. Support local arts reporting! The fact that Fort Worth is the home of terrific theater is no longer a well-kept secret. And there is no better example of how good it can be than Stage West, which recently celebrated its 40th birthday by announcing a $3 million upgrade to its building on West Vickery Boulevard. 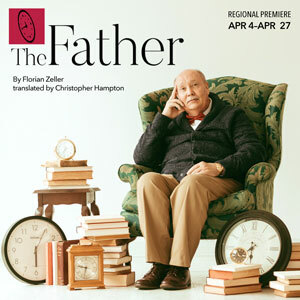 Its regional premiere of The Father: A Tragic Farce is a tour de force for lead actor David Coffee, whose percolating performance about a man facing his final years resonates deeply with anyone who has lived through the trial of a parent's dementia. The director of the Stage West version is Tina Parker, who as an actress has appeared as a recurring character in Breaking Bad and Better Call Saul. Also noteworthy is lead actress Jessica D. Turner, who, in a poignant performance, appears as the daughter of Coffee's character. Turner is the real-life daughter of R. Gerald Turner, the president of Southern Methodist University, who on opening night was there with his wife (Jessica's mom) and their son-in-law (Jessica's husband). "It's such a wonderful female role," Jessica Turner said. "It's so rich, and it's all about the trials of caring for your aging parent. You are getting older. Your parent is getting older. My grandfather actually suffered for about 15 years with Alzheimer's. My grandmother took care of him until she just couldn't anymore." The play, written by French novelist and playwright Florian Zeller and translated into English by Christopher Hampton, "really resonated with me," Turner said. "First of all, it's such a well-written play. And to have such a tight play to work on was wonderful. We decided to take every scene as its own little play. In so many of these scenes, there are contradictions, because you don't know what Andre [the lead character] is remembering. We decided to take each scene and just play it as that truth for that scene. And once we did that, it really opened it up." Turner has found herself thinking a lot about her grandfather, who died when she was in her late teens. "A lot of the things that happen with Andre are very true," said the actress, who finds that after a performance, "I get so many people wanting to tell me their stories about caring for their parents or their grandparents. It's really striking a chord with people, this play."